London developer Cube Haus has commissioned Adjaye Associates, Faye Toogood, Skene Catling de la Peña, and Carl Turner Architects to design affordable modular houses for awkward urban sites. The start-up was set up last year with the aim of delivering "high-design value homes at reasonable prices" that can be configured to fit small and awkward urban sites. It aims to "disrupt" the existing housing market and offer "a fresh approach to resolving the housing crisis". 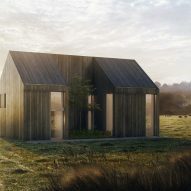 Founded by entrepreneurs Philip Bueno de Mesquita and Paul Tully, Cube Haus has commissioned four leading architects and designers to design modular homes, which can be customised for different shaped plots of land. 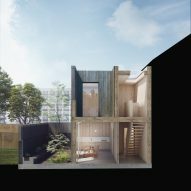 Adjaye Associates, which is led by David Adjaye who is on the judging panel for the inaugural Dezeen Awards, has created a timber-clad two-storey house that could be added to a typical London terrace. Visualisations of London-based interior, furniture & fashion designer Faye Toogood's concept, shows a simple timber house with a pitched roof and a lofty open-plan living area. RIBA Manser Medal-winning Carl Turner Architects has created two concept designs for the developer. The first is a long low-lying bungalow with bright yellow skylights and a courtyard to funnel light into the house's central spaces. The other is a spacious town house with a central courtyard and two pithed roof volumes clad in brick and timber. Finally Skene Catling de la Peña's design for Cube Haus is a series of boxy stone-clad volumes arranged around a structural chimney stack. This chimney stack is expressed with fireplaces in the bedrooms, that have tall windows and light coloured timber walls and floors. The brand believes that modular construction will allow houses to be quickly and economically configured to fit any shape or size of land plot including back land sites, gap sites and rooftops. Components will be made off-site in factories located in the UK, with the frames of the buildings made from cross-laminated timber. "The Cube Haus delivery model creates economies of scale that make innovative architectural design very accessible," explained the brand. "People who might never have considered using an architect, let alone a renowned contemporary practice, will be able to do so." "We looked around and realised that there was an opportunity to marry some of the awkward urban spaces we often come across unexpectedly in the city with great new buildings," said Paul Tully one of the directors at Cube Haus. "We are able to work at lower margins than the big house builders, due to our nimble approach. Importantly, we work with architects we respect so that we can focus on the craft of making and building great looking, sustainable homes with an approach that is at once ethical and ground breaking." In the longterm the brand aims to build up a portfolio of building types that can be scaled up for larger sites that can accommodate more units. Co-founder Philip Bueno de Mesquita added: "We've seen how some of our most creative designers have put their brainpower into trying to solve London's housing issues." "They've got great ideas but have been stymied when it comes to building more than one or two properties because of the way land has been made available and developed in the past," he continued. "That's what we want to challenge – the housing development model in London." 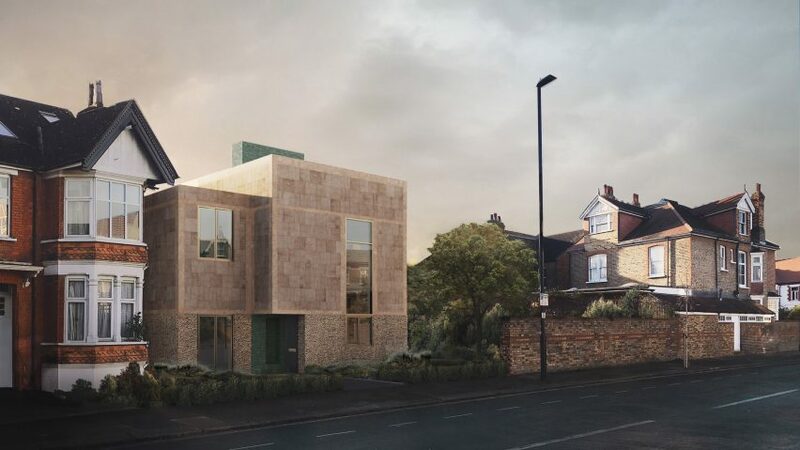 Cube Haus aims to take advantage of The Homes and Communities Agency's £3-billion Home Building Fund, which aims to support custom builders and regeneration specialists, alongside larger developers and builders. Last year Royal British Institute of Architects president Ben Derbyshire said that the extra £2 billion that prime minister Theresa May put towards building new affordable housing is nowhere near high enough to solve the housing crisis.